Both these Kelpies were sold to Patrick Stubbe in Belgium who bought Noonbarra Keppe some years ago. He is hoping to set up a little breeding stud over there and these two pups were selected for that reason. We worked hard on both these pups to ensure they would do the work he required. 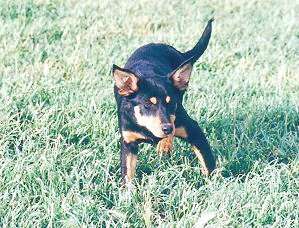 They were not exported until 5 months of age and by that time we had put in many hours of training and they were both outstanding young Kelpies. * giving them a great basic education. mostly you do for other pups. I feel quite happy about that." Crom and Betje are just great pups! We are still in a process of adapting to each other.. This first week, I tried to spend as many hours as possible with them. Just observing and giving them a good feel when they come near to me. "I once introduced both pups to some 3 ram lambs. You know better than me how keen they are on sheep. I saw eye, controll and fearless action, all in the 3 minutes I had each of them on sheep. But this was an open field. The pups are to small to run fast enough around these pretty difficult sheep. This is not yet the time to go further on that. First we need more bonding and I must have at least a relyable down before I ever will start them." "Thanks once again for sending my two such nice looking, keen working, fast learning pups and for all the work you did already before! Of course you will hear again about the progresses we make." 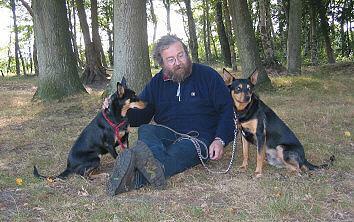 I started basic obedience training this second week the pups are here in Belgium. We do just funny things. I have a very reliable sit down and 'not a bad' "stay there" on both dogs. They also do walk very well on a lead. I use your forced down-strategy and do formal training too. Today, I introduced both pups to sheep. I have 15 quite well dog broken sheep close to the house where I train my elder dogs already all summer. 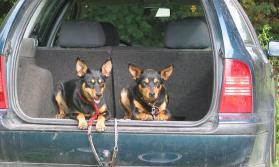 We first had done other activities so the pups weren't not that fresh and overexcited. I did some 10min. walking with each pup individually. I had Torka (the BC) around stock to guarantee for no big problems. He is relyable for that. I know he is 100% attention and comes in when a sheep tends to harm the pup. BOTH PUPS ARE GREAT ON SHEEP. We just did some walks. Both pups went from the one to the other side the whole time (keeping stock compact together) while I was walking forwards, making sharp curves, went trought the sheep, aso. They were absolutely not overexcited. As if this was their diary training. Crom only jumped once into gap of the flock. But just for that, both pups ran from side to side to keep stock close together. No harming any sheep. Crom went to the heads if stock passed me. Betje did not have a chance to do that, for I changed position myself all the time. Both pups adapt their position to me to make all time the sheep to follow me. It was not that difficult to get them stopped. Both reacted on my Sit -commmand after a few attempts when I stood between them and sheep. From this very first experience, I guess they will be a lot easier to train on sheep than Keppe was in her beginning time. In general, Betje is a very much more active dog. She is absolutely curious for every thing she marks. That makes her a bit more difficult to get her attention. completely surprised about the calmness and great balance I saw! prepared, so everything went well. stop/ etc... I used a sit-commando which they perform quasi perfectly at home. Patrick wrote this up on the Working Kelpie Club's Discussion Group on the internet in February 2003. A question: do you call a "no fear dog" a dog with lots of power? I have a pup (NoonbarraXCapree) that I should defend for herself for she goes through any situation and gets it organised the way she wants it. On the other hand I have a male (NoonbarraXNoonbarra) that is quite a different dog. 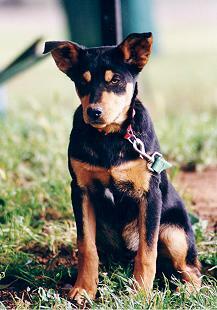 He is an overall thinking dog and works so much calmer than any young Kelpie I ever saw untill now. He is seems to read stock better than that very busy other pup. But both get the job done in their own ways. I could not say that the thinking dog is lesser powerfull. But the picture is very different when you look them working. Part of a letter from Patrick Stubbe in Belgium (Europe) who runs the Kessel Kelpie Stud. He owns Noonbarra Betje who is now just over a year old and is a daughter of Capree Dyna. I felt astonished reading that Capree Dyna was brought in for sale! Betje is an absolutely no fear dog that behaves in full self controll. that's rather a good sign to me than it is a problem. is great in obedience training. So I can make me a very concrete picture of how her mother must be. That's why I am interested to get her in Europe. would even search for the money to purchase her. here where this wonderfull breed has started its way as a working dog. out of concentration she is not that difficult to return to work the flock as a whole. And if ever a very reluctant ewe tends to defend her lamb, Betje only gives the necessary seconds and acts that fraction before the ewe comes up. And if a ewe just slowly gives her (for example by going backwards slowly), she stays calm and solves the problem in a full controlled way. Betje is an absolutely no fear dog that behaves in full self controll. Her keenness to work makes her a bit difficult to come off stock, but that's rather a good sign to me than it is a problem. Beside that, Betje is an adorable dog around people and other dogs. She is great in obedience training. I must report how well Betje seems to have understood well her training sessions of last week where I insisted on widening her flanks... I had great results with Crom in the last month, so I thought that Betje should be at an age to respond better to my demands too. That's the way it goes with these dogs ... for weeks or even months you try to work things out with them and it doesn't work as you want. He now has turned (back) into the keen dog you sent to me. We are doing very little stockwork. Let's say once or twice a week he joins an older dog when gathering ewes for checking new lambs, for extra feeding. Just as Betje, he has only seen sheep inside the training field. He shows up such a calm behavior and stays easily behind stock. He is even more obedient than Betje is! � after 10 days, I gave him a try on weaned sheep in an open paddock. That's where all 3 the Noonbarra dogs proof their genetics... I can use each of them now for most of my sheepwork. Without them, this project would never be possible at the level I do it. 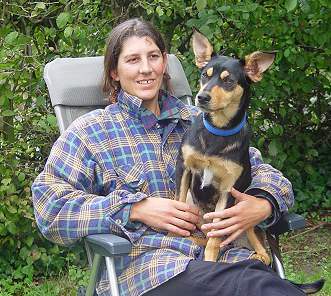 Allthough Keppe is off course the best in fetching sheep in large timber/bush paddocks and of course Betje is my best yarddog ... slowly on Crom is becoming my prefered dog because he develops so fine into a wide outrunning, independent but relyable partner ... It is somthing difficult to explain, but there is a different understanding between us that intensivates our relation. I wonder if this has to do with his breeding or is just the personality or even just my personal projection into that dog. This is Kessels Lyn bred by Patrick Stubbe. She is by Noonbarra Crom from Noonbarra Betje.